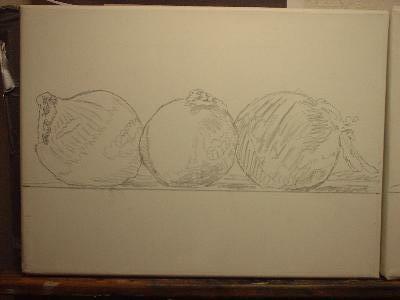 Still Life Onions oil painting demonstration, Part 1. Home > Tips from my easel. > This demonstration part 1. 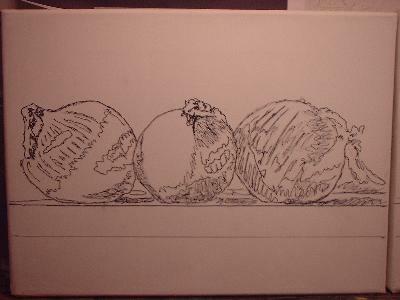 A Still Life Onions demonstration. 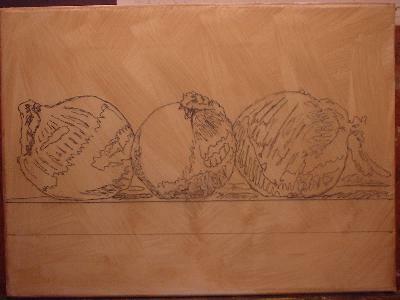 Here's the start of a new piece in Oil Painting Tips from my easel. A customer contacted the gallery for an order to match another piece they had purchased. I wanted to give here a walk through the entire process. Their instructions were a dark background, grey shelf with onions! We can do that! Below is the reference set-up. Here's the pencil drawing of the reference still-life. This is to capture my main forms, some of the details, a bit of the shadows. This picture can be very complex and detailed if you wish, as it will help in later parts of the painting process. This particular drawing was however a bit more loosely done. Then comes the ink drawing which will preserve the base image. 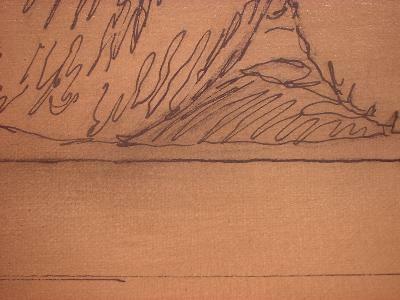 When the canvas toning step is taken, the pencil will wash away, so the ink makes this a permanent part of your painting. Older works found in the museums of the world show this as an important step in the process of painting. Again, this was loosely done just to capture the main parts. I also always check my shelf in the painting at this point to make sure it is level from left to right. It will be hard to correct after the ink is put down. Then the imprimatura coat roughly brushed in. You can see the brush strokes as this light coating was applied. I then came in with a large mop brush and smoothed out all of these brush strokes so that the canvas has a smooth even light tone to it. As seen, this is a closeup of the painting, and you cannot see any brushstrokes within the paint. The mop brush is such a marvelous tool. Learn to use it and it will serve you well! Keep us bookmarked so you can return to see the progress of this work. 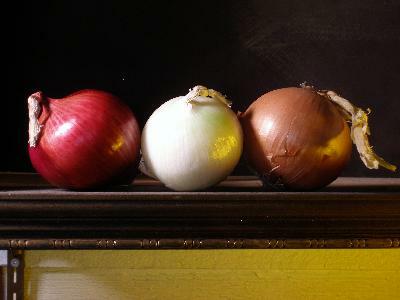 Click here to return to the Top of Still Life Onions Demonstration. 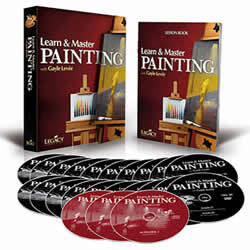 Click here to go to the Umber Under Layer of this demonstration. Click here to see the color layers of this demonstration. 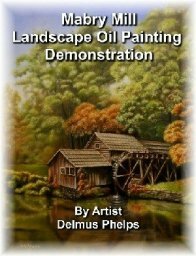 Click here to go to the Finishing Layer of this demonstration.